As savage as the beasts that inspired it. The Onnit Primal Bells have become a staple in the fitness community, famous for their durability, functionality, and savage appearance. As the popularity of the Primal Bells have grown, so too has the demand for a workout program that’s just as fierce. Introducing the Onnit Primal Workout Video. This program utilizes over 30 different exercises to hit your body from every angle. These include a variety of kettlebell movements, from explosive ballistic swings to strength building grinds, coupled with high intensity calisthenics. Kettlebells are a staple of functional training and the reasons are obvious; they offer more efficient benefits pound for pound than any other training method available. Whether you're looking for a stronger core, arms, and legs, or if you just want a quick way to stay in shape, the Onnit Primal Bell Workout program will make it happen. This is a complete, 5-week workout program consisting of 20 different workouts. These workouts are designed to challenge both beginners and advanced lifters while working out your entire body, forcing you to use multiple muscle groups at once. What does this mean? It means that you'll be learning to use your entire body better while you move, translating into more functional strength in the real world. Incorporating the same principles of the Onnit Academy Certification, this program will improve your body safely and efficiently. Rather than performing hundreds of repetitions of the same exercise, you'll utilize a variety of different kettlebell movements to push your strength, power and endurance beyond your limits. The Onnit Primal Bell Workout program is a complete kettlebell curriculum that will increase strength, endurance, and overall performance like nothing else you've tried before. The Onnit Primal Workout Program is available instantly as a digital download or pre-loaded on an exclusive 8GB custom Primal Chimp USB drive. The Onnit Primal Workout Program loads right in your web browser with full menu functionality. The 8GB USB Drive is designed to look just like the 36lb Chimp Primal Bell and can be re-used and filled with anything you want. 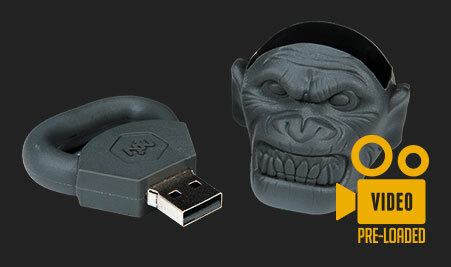 USB Primal Chimp 8GB Capacity also includes the digital download at purchase. The digital download file is available immediately after purchase and plays in most modern web browsers. Double-click on the file to extract it. 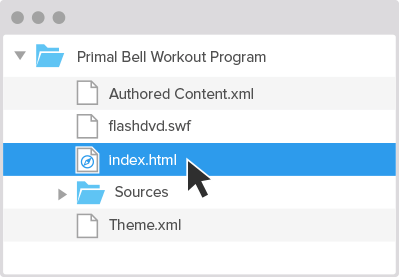 Open the Primal Bell Workout Program folder. 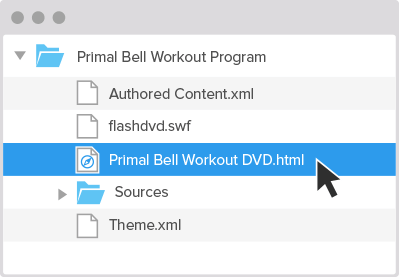 Locate and double-click on Primal Bell Workout Program DVD.html to load the Flash DVD player in your web browser. Insert the USB drive in your Mac or PC. Locate and double-click on index.html to load the Flash DVD player in your web browser.